Vaguely continuing the video games + music theme of the last post, there's a game out, which I don't own and am unlikely to own, called ExciteTruck for the Wii. It's the long-awaited second game in the Excite[vehicle] series, which heretofore was assumed to be just a single game, ExciteBike. - horizontally, with the buttons facing towards you and hands gripping both sides of it. You then steer your truck by rotating the Wii remote clockwise and counter-clockwise, mimicing the motion of turning a steering wheel. But that's not what I'm interested in. ExciteTruck, like most video games, has a soundtrack. Also like most video games, ExciteTruck's soundtrack is bad. ExciteTruck's soundtrack consists entirely of metal tracks by 80s hair metal tribute bands. Perhaps realizing how terrible the music they had put into the game was, the makers of ExciteTruck did something interesting: They let players create their own soundtrack. 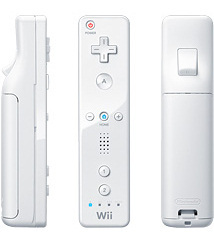 The Wii has a port for an SD memory card, which is a fairly common memory card used mostly by digital cameras. ExciteTruck allows you to load MP3s from your personal collection onto an SD card, plug the card into the Wii, and use those MP3s as the game's soundtrack in place of the music the game provides. This isn't incredibly innovative; some PC games (though surprisingly few) have had this feature for years, and it's entirely possible that some other console, like the XBox, had games that let you do this sort of thing. Still, it isn't nearly as prevalent yet as it probably ought to be. The idea of custom soundtracks for video games raises a lot of interesting possibilities. I tend to be more tolerant of video game soundtracks than the average player, but I also know people who out-right cannot play video games with the music on. Not only does this let people who dislike game music participate in the full multimedia gaming experience, it potentially unlocks a new level of fun tinkering for people who enjoy fiddling with things like I do. It adds a new game-outside-the-game that challenges the player to play the game, get the feel for it, and attempt to match music from her collection to the game experience. There are some games (and here I am thinking of ExciteTruck) where the game of creating the perfect soundtrack would probably provide more enjoyment than the game in itself. Which is all well and good, but, as a practical matter, even if I this feature were to become commonplace I would probably wind up sticking to the games's original soundtracks. I actually tend to like video game music, which is why I have a bunch of free MP3s of video game music remixes and tributes on my harddrive. And which also means that, if I were to create a custom video game soundtrack, it would be likely to consist mostly of music from other video games. This page contains a single entry by Zach published on January 20, 2007 12:54 PM. BadSongStravaganza!!! was the previous entry in this blog. The Best Way to Be Professionally Responsible is to Do Your Job Well is the next entry in this blog.